Range is closed — too wet! 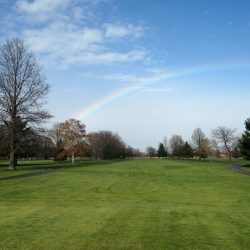 Green Meadows Golf Course is located in the beautiful wine country of North East, PA, along the shores of Lake Erie. Our 18-hole, public golf course is a well-manicured, par 71 layout with three sets of tees. The course provides challenge, yet is suitable for any age and skill level. A grass tee driving range is available to fine tune your game. Other amenities include a fully-stocked pro shop competitively priced, a snack area serving legal beverages, locker and bag rooms, and a picnic pavilion.